Lately I’ve been obsessed with the moon. I love watching it. I love the way it changes from day to day and night to night. I got a new camera last year and I’ve been playing with some moon shots here lately. 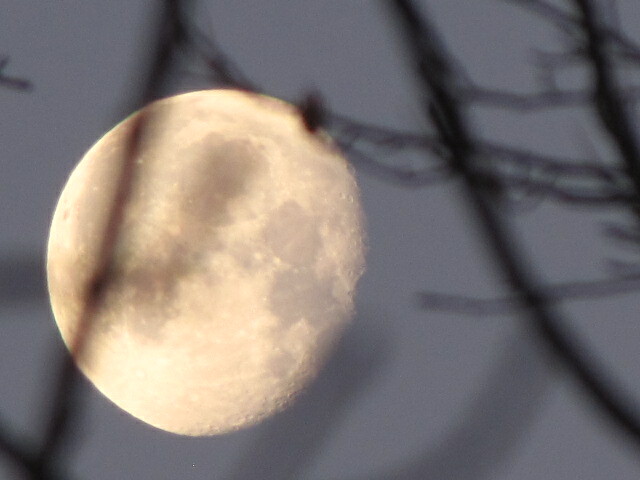 I took this (and several others) late afternoon on February 13th, without a tripod. Fun stuff. The moon was shining in the east, so I propped my elbows on my car and snapped away. Back in January I was up around 7 in the a.m. I looked out back and though the sun was up, the moon was out as well. This was taken in the lightness of day in the morning. The moon was in the west this time. I held my breath and stood on the deck, snapped a few shots and watched the transition. Amazing. We also had a few warm days here of late. That was nice, but at the same time all it did was tease every body into wearing shorts and flip flops for two whole days. I couldn’t do that, as my summer gear is packed away. Probably best. I’d hate to see what my white legs look like in shorts right about now. Anyways. 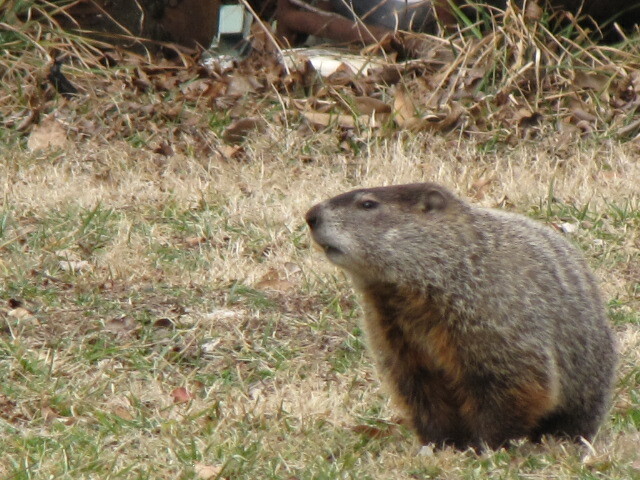 We’ve got a family of groundhogs that reside on our property and the property next door. I tried to get a shot of these two together. But (no pun intended) as you can see, I didn’t have much luck. Maybe next time. 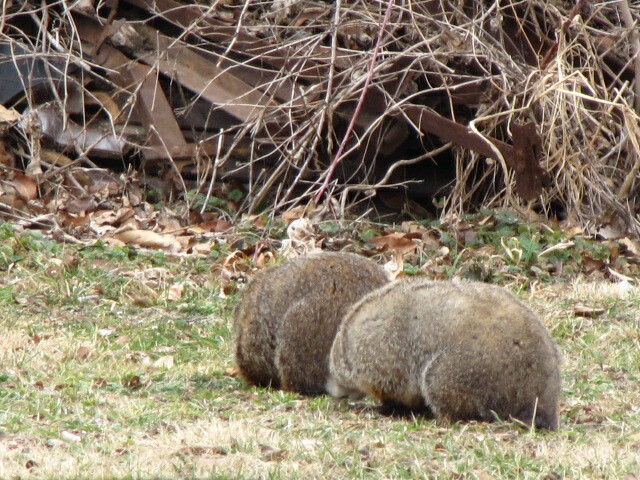 These groundhogs are the same size as our small dog if not a tad larger. Crazy. I hope they have more babies this year. I think the year before last, they had three small ones. They are pretty darn cute. 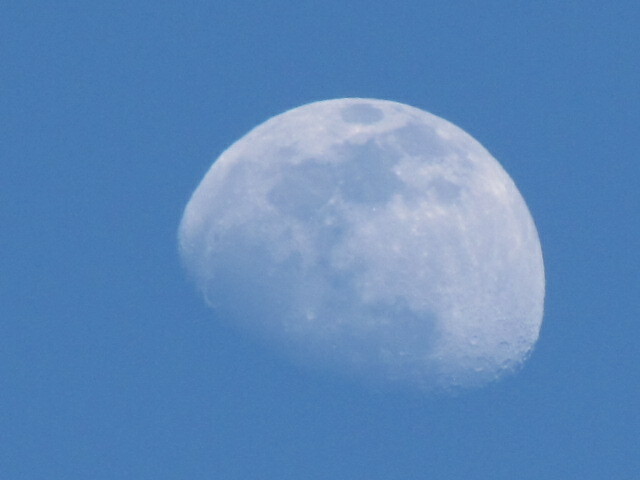 Categories: nature | Tags: groundhog, moon, photography | Permalink. My husband has access to a secret lake not too far away. Today was a beautiful day so after I got home from teaching my yoga class, he asked me if I wanted to go shooting. I always laugh as he knows I don’t really care for guns. I said, “No thanks” and he replied with, “I meant you and your camera.” I grabbed my camera and he loaded several guns (for himself to shoot) and off we went. The gate at the property is locked with a giant padlock. My husband and others use this land to hunt, fish and shoot guns. There’s a good sized lake out there as well. It was built in the 50’s. None of this can be seen from the road. One has to have a four wheel drive to even think about entering. It’s awful. Awful like your head bounces up to hit the headliner in the truck. More than once. Big ruts, crevices and steep hills with the added crossing of a creek all before you hit the lake. Then you arrive. I don’t know who built this chair, but I love it. It’s sturdy and stuck into the ground. While he was shooting his assortment of ammunition that he’d reloaded himself, I took a huge hike. Some people have built little shacks with smokers and what not for hunting in the cold weather. Some people have just brought in sheds (I would’ve liked to have seen how that happened on this type of terrain) and some people went all out and have sweet little house like cabins with docks and the whole bit. I think there’s like 180 acres out there, it’s quite a large space. My husband said this is called Goldenrod and supposedly it means there will be frost six weeks from when it blooms. To that, I say duh. It will be October. Might be a chance of frost ya think? Old timers are interesting. I spent lots of time looking for different kinds of insects, flowers and wildlife. Got some great shots of funky spiders and webs. I saw lots of flowers, but not much in the way of wildlife. I wonder if the noise from the shooting of guns had anything to do with that? I think so. All in all, a perfect end to August. Categories: nature | Tags: canon, lake, missouri, mo, nature, photography | Permalink. Vacation. Is over. I’m back in the real world of laundry, grocery shopping and teaching yoga. In a series of short words and photos, here’s what we did. The first part of my trip was spent at my parents home in Englewood, Florida. Pool time. Frogs and anoles. Movies. Thanksgiving dinner. Short walks to the beach. Sunsets. Finding sharks teeth. Swimming in the Gulf. Family. Books. Good snacks. Sleeping late. Exploring with my new camera. Staying home, relaxing. Categories: family, travel | Tags: anoles, beach, englewood, florida, Gulf, intracoastal, mexico, photography, sea, turtles, waterway | Permalink. I came home from Eureka Springs on Wednesday only to leave again on Friday. This time it was to the exciting town of Bolivar, Missouri for the Kukal Family Reunion. This shin dig only happens once every two years for my father-in-law’s side. My mother-in-law on the other hand, has a family reunion every single year, in the same big town of Bolivar. I’d never been to Bolivar before I met Frank. Several of his relatives live on farms so that’s always on the agenda. I didn’t grow up on a farm nor did I ever spend any time on or around a farming community. Frank’s aunt has a lovely, huge garden where she grows the best sweet corn ever. Of course she grows all the other good stuff too. Sporadically throughout her garden she’s planted beautiful flowers. I just got a new camera and this was my first venture with it. I had a great time with the macro option. I took all these with the auto settings. Need to read up on the manual stuff. For lunch we met at a church. Around the church, I looked for things to take pictures of. I found a wasp nest, a bunny and some baby birds. I spent a lot of time playing with my new camera and reading a book. I’m not an anti-social person. But, I am five years new to this family and when every one has known every one since they day they were born…..well, you get the idea. I will miss the next reunion the end of this month as I’ll be in Florida. Hopefully taking lots of great photos with my new camera that I will have learned much more about. Until then, it’s back to the regular grind until July 21st. Categories: family | Tags: bolivar, camera, family, farm, missouri, mo, nature, photography, reunion | Permalink.